If you can’t think of sweet and beautiful compliments for her, check the list below and you will find many words to praise her beauty and intelligence. A beautiful compliment is one of the little things girls want to be impressed by a guy. Talking with the girl you like online or face to face is always a challenge. If you want to make a good impression, you should make use of all your weapons. But be careful on how many compliments you say to a her, because you may have the opposite results. ♥ Your intelligence and conviction are powerful. ♥ Your beautiful smile brightens my day. ♥ Your eyes are beautiful because they are filled with kindness and intelligence. ♥ Your strength in the face of obstacles is amazing. ♥ I enjoy your unique perspective. ♥ I’m charmed by your sense of humor. ♥ The kindness you show to everyone is inspiring. ♥ You make a huge difference in the lives of those around you. ♥ I want to be like you. ♥ No matter what you wear, you always look fantastic. ♥ I love spending time with you. ♥ Your encouragement makes me feel like I can change the world. ♥ Your presence warms the coldest heart. ♥ I have the most fun when I’m with you. ♥ Your voice adds cheer to the most dreary day. ♥ Your creativity and artistic ability blow me away. ♥ I’ve never met anyone as trustworthy and honest as you. ♥ I like how you know exactly who you are and what you want from life. ♥ You’ve given me a whole new perspective on life. Thank you. ♥ The sound of your laughter makes me feel like I just won a million dollars. ♥ I love the way you take care of me. You are such a selfless person. ♥ Your style is amazing, and I wish I was as fashionable as you. ♥ You make me want to be better and better every day. ♥ I’m fascinated by your lips because they always say the most amazing things and outline the most beautiful smile. ♥ You are like a dazzling diamond that I will treasure always. ♥ When I’m not around you, I’m thinking about you. ♥ I’d rather spend time with you than anyone in the world. ♥ I feel like I’m on vacation from all the world’s troubles when we’re together. ♥ You put a lot of effort into caring for others. I appreciate you. ♥ You are my favorite person to talk to. Thank you for listening with a caring heart. ♥ I trust and value your opinion. You make insightful observations. ♥ Whenever I see you, the clouds roll away and birds start singing. ♥ I can’t imagine life without you. ♥ I can’t take my eyes off the beauty you radiate with that confident smile. 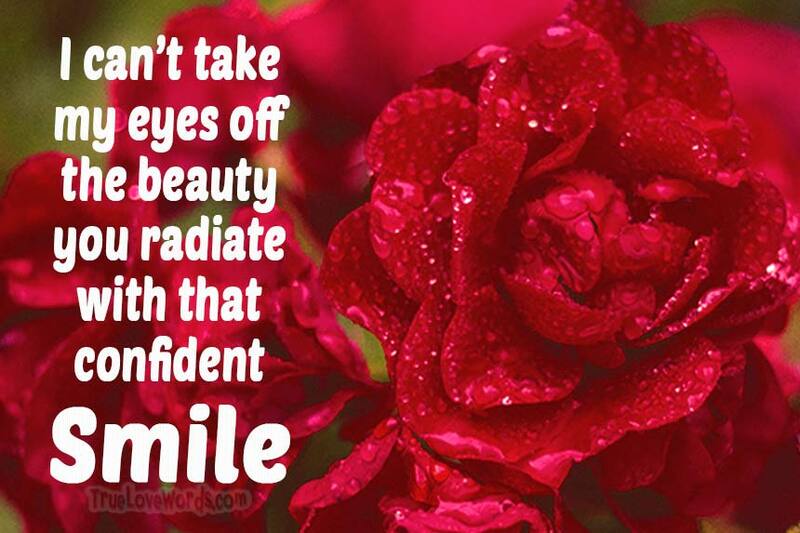 ♥ Your confidence is attractive. ♥ I’m sorry that it took so long for us to meet. ♥ I’m drawn in by your warm, intelligent conversation. ♥ I like how you really know what you want, and how you are fearless when you go about getting it. ♥ The sight of you in that dress is stunning. ♥ The first thing I noticed about you is your elegance. ♥ I like how your spur-of-the-moment ideas keep me on my toes. ♥ Your energy and bold spirit make me want to be with you forever. ♥ No matter what you encounter, you are always classy. ♥ Your loveliness takes my breath away. ♥ You look professional and polished. ♥ Your flamboyant personality excites me. ♥ You are just the spark my battery needed. ♥ I am exhilarated by your energy and passion. ♥ Your flawless intuition astounds me. ♥ Your humility and grace cause people to take notice. ♥ You have brought great joy into my life. ♥ I love how you make ordinary events romantic. ♥ I could listen to your heartwarming stories all day. ♥ Your feistiness and zest for life motivate me. ♥ If someone wrote a book about you, it would be a bestseller. ♥ The sight of your beautiful face framed by your soft hair is hard to resist. ♥ I am comforted by your hugs. ♥ When I focus on you, the big picture is revealed. ♥ If life was a river, I’d choose to paddle alongside you. ♥ There is an overwhelming peace when I’m in your presence. ♥ You always know the perfect thing to say. ♥ Your beauty is enticing. ♥ Your taste is impeccable. ♥ Thanks for always keeping your cool. ♥ I’m so glad we belong to each other. ♥ You have blessed my life with peace and love. ♥ You make loving you as simple as breathing. ♥ To be with you is to be alive. ♥ No matter who is in the room, I always find myself staring at you. ♥ In a world of background noise, you are a cheerful melody. ♥ I can never put into words how much you mean to me. I love you more deeply each day. ♥ A day without you is too long. You are like a shade tree in the desert. ♥ My eyes can’t wait to see you each day, and my lips can’t wait to kiss you. ♥ Wherever you are is where I want to be. ♥ You motivate me to exercise. Who wouldn’t want to work out next to your flawless figure? ♥ Your love is like an orchard: sweet, sustaining, and beautiful. ♥ Your enthusiasm and passion for life is contagious. ♥ All my dreams came true when I met you. ♥ You are always the highlight of my day. ♥ Holding your hand is the best medicine. ♥ I love how your eyes outsparkle your diamond earrings. ♥ Whenever you walk into the room, my heart thinks it’s the Fourth of July. ♥ I have never been more proud to call you my girlfriend/friend/wife. ♥ You make each day a celebration. ♥ I can’t wait to see what adventures are in our future. You make everything fun. ♥ When you sing, my ears are happy, but my heart is overjoyed. ♥ No matter who I may meet in life, no one will mean as much to me as you do. ♥ You have amazing vibes, and I want to be with you forever. ♥ Your strength and determination help me believe in myself.